Just A Car Guy: There seems to be a misconception about a shortage of 23 window VW buses... there won't be any shortage. Have you seen how many they're building replicas of, at Yumos? There seems to be a misconception about a shortage of 23 window VW buses... there won't be any shortage. Have you seen how many they're building replicas of, at Yumos? 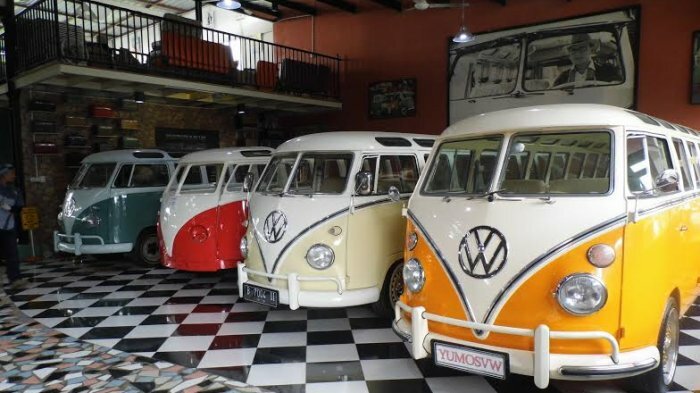 Yumos VW, Semarang Indonesia has a crew of 30, and exports 90% of their finished vans. They make the vans from new parts, old 11 window vans, and a hell of a lot of work. They take old Brazilian 10 windows, add a new aftermarket nose clip, etc etc is what I get from reading around the internet. Yudi makes VW type Combi Brazil into VW type Dakota. Brazilian combos are rarely glimpsed because the cost of re-assembling with a selling price is not comparable. The form is also considered less unique. Different eg with German Combi. Yudi prefers Brazilian Combi purchasing cost of Rp 20 million, Rp 60 million for the revamp cost. No buyer would pay that much for a Brazilian Combi. "VW Brazil ngeding, I bought from the owner. His condition was ruined, there was no engine, only skeletal left. The concept of recycling is made into a dakota, "said the man who crossed the world overseas thanks to VW. "I try to find a gap opportunities by making a basic clone. Take a Brazilian Combi that looks the same. Just change the front shape. Moreover Brazilian Combi population a lot, the condition is destroyed and the owners do not intend to fix it again, "said Yudi.